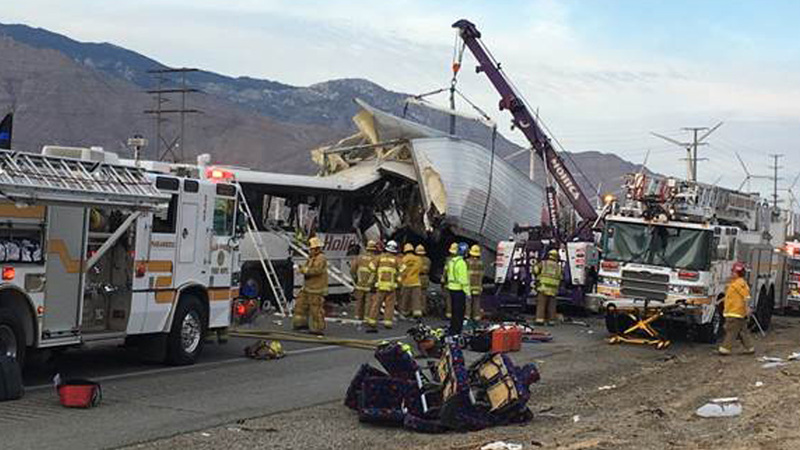 PALM SPRINGS -- Thirteen people were killed and 31 others injured Sunday morning when a tour bus and a semi-truck collided on the 10 Freeway north of Palm Springs, a California Highway Patrol spokesman said. All westbound lanes of the highway are closed and traffic is being diverted, according to the CHP. Photos showed the front of the passenger bus crumpled entirely into the semi-truck's trailer after the wreck. Emergency responders used tow trucks and a crane to lift the trailer to provide easier access to the bus, whose front end was demolished. Thirty-one victims have been taken to hospitals. Desert Regional Medical Center in Palm Springs received 14 patients: five in critical condition, three in serious condition and six with minor injuries, hospital marketing director Rich Ramhoff said. Eleven people with minor injuries were sent to Eisenhower Medical Center in Rancho Mirage, spokesperson Lee Rice said. JFK Memorial Medical Center in Indio received five patients, all with minor injuries, chief development officer Linda Evans said. The bus was coming from Red Earth Casino, near the Salton Sea, the CHP said. The agency said the driver was one of the owners of the tour bus company, Los Angeles-based USA Holiday. The company has one vehicle and one driver, according to the Federal Motor Carrier Safety Administration. Records on the agency's website show it had no crashes and one inspection in the two years before Oct. 22 and had a satisfactory safety rating. A phone and Facebook message left for the company was not immediately returned. Its Facebook page has postings about trips leaving the Los Angeles area to casinos around the Coachella Valley and Las Vegas. The National Transportation Safety Board announced on Twitter that it was sending a Go Team to investigate the crash.